A growing middle class, increasing income levels, changing lifestyle and demographics, continue to drive global specialty packaging demand. Busier lifestyle and increasing urbanization have led to an increase in food on the go, viz. microwaveable packaging, carry away packs, re-sealable packs, easy-to-open packs and longer shelf life packages. Sachets and single portion packs are a global trend today. The majority of food products today are available in smaller variants. Introduction of such packs enabled FMCG companies to expand their reach to sub-urban and rural markets. 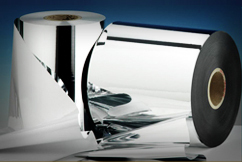 Ester not only offers great solutions in “flexible packaging” using Polyester Films such as Metallized Ultra High Barrier film, Transparent High Barrier film,Gold Film,Heat Seal film,Twist Film &Matte film but also solutions in “rigid packaging” from Specialty Polymers such as PET resin for Extrusion & Thermoforming etc. These products meet the diverse packaging needs of our clients worldwide. Our strong commitment to quality helps us deliver cutting-edge technology that enable food brands to gain that much-required competitive edge in the food sector. Each of our products is designed in such a way to perform one or more of the four basic functions of packaging – Containment, Protection, Communication, and Utility.